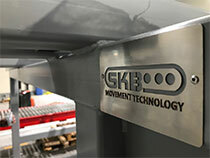 SKBS Movement Technology manufactures and provides intra-logistics related installations and equipment’s. For a more accurate understanding of the requirements of the project, contact us and we will set the details together. When you’re plan is to implement a complex transport intra-logistics project, we’re here to help you get your job done. No matter what your industry is, our team of specialists is ready to provide the integrated solution.